SHEBA, ISRAEL (THE JEWISH PRESS)--A group of smiling Nigerian heart surgeons begin their morning rounds in Sheba Medical Center’s Safra Children’s Hospital Emergency Heart Surgery Division alongside some of the department’s top heart specialists and under the watchful eye of Dr. David Mishali, the Director of the Edmond J. Safra International Congenital Heart Center at Sheba. They are in the midst of beginning a two week training course at Sheba Medical Center, the largest hospital in Israel and the Middle East. 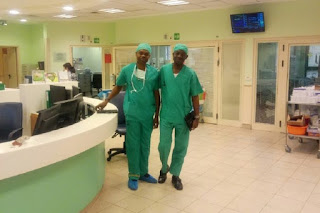 Dr. Mishali has become somewhat of a legend in the eyes of the Nigerian medical community, traveling several times a year to Africa’s most populous nation (186 million people) since 2013, in order to train a growing number of doctors to repair heart defects in Nigerian children, one of the leading causes of childhood mortality in the country and Africa as a whole. The trips to Africa and the training of Nigerian surgeons at Sheba are an integral part of the Israel Center for Disaster Medicine & Humanitarian Response organization, which is based at Sheba and spearheaded by Professor Elhanan Bar-On. A case in point, on one of Dr. Mishali’s early missions to Nigeria with a team of volunteer heart specialists from Sheba, they came across 11 year old Fuaz, who had joined his parents on the 300 mile trip to accompany his younger brother Fuad who had been scheduled for heart surgery. Noticing that Fuaz appeared unwell, the Sheba team decided to examine him too, discovering that he was suffering from a mortal congenital heart defect. In order to save Fuaz’s life, the Sheba team reworked their busy schedules to perform emergency surgery on him. Were it not for the vital intervention of Sheba’s pediatric heart surgeons and staff, BOTH brothers would likely have lived for only a few more days. Dr. Mishali believes in the talent of the Nigerian heart surgeons, who are being trained at Sheba. “They are highly skilled doctors who want to learn and help their people back home,” he said.